Traditional homes at the time had large entrance halls to properly greet several guests at once and to make a statement about the owner’s wealth and position. Visitors are greeted with the word Haleono, Hawaiian for “Sweet Home,” which is carved into the fireplace. This is one of the many Hawaiian elements throughout the house, reflecting the marriage of Henry Strong’s daughter, Helen, to George R. Carter, then governor of Hawaii. 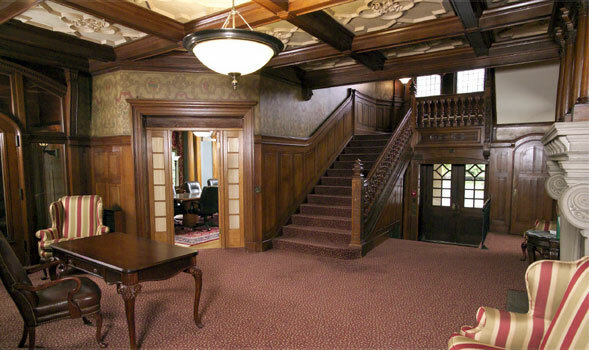 An original canvas covers the wall and a spacious staircase with a hand-carved railing leads to the second floor. When the Strong’s lived here, a gigantic globe used to be positioned in the entrance hall in front of the fireplace.